I’ve recently spent a couple of weeks back in Los Angeles, where it was an absolute delight to visit the (Downtown) Santa Monica Farmer’s Market once again (held each week on Wednesday and Saturday). As you might expect at this time of year, the stalls were almost literally groaning under the weight of fresh produce, and the streets were full of people jostling and straining to see what was on offer. It was bustling, noisy, vibrant and full of energy. It was everything an open-air market should be. And above all else, it was colourful. Despite the grey skies that held the morning marine mists, it was delightfully and unapologetically bursting with colour: courgette flowers beaming delicate yellow petals; summer berries tinted red, purple, blue; and an incredible range of vegetables in at least fifty shades of green. But (for me at least) there was one crop that stood out among all the others. And that was the tomato. Heirloom tomatoes (or heritage tomatoes as they’re often called in the UK), have become increasingly popular over the past few years – largely in response to a growing market for more ‘natural’ foods. Unlike the more commercial equivalents, which are bred for their relatively uniform colour and size, they are characterised instead by their non-conformity. Amazingly, I actually smelt them first – an intense aroma that’s sweet and sharp, fresh and earthy. Then the wonderful colours caught my eye; smooth and shiny yellow, bright red and deep purple (reminiscent of plums), even a hint – or more –of green. The best ones are tinted or flecked with multiple shades. My favourite are beautifully striped in red and orange. They were everywhere, piled high in boxes, tumbling out onto tables, and it would have been impossible for me to resist them. I made my choice carefully, taking delight in selecting each one individually. Biased by size and colour, I would pick it up and smell the cut stem before placing it in my basket. At this point it was pretty much inevitable that I was going to be having a tomato salad for lunch. I cut just a couple of them into generously thick wedges and tossed them with olive oil. I had also bought a bunch of basil (green, sweet, aromatic), and added some torn leaves. The final step was just to add a sprinkle of salt. And if you’ve got some fresh bread, then that’s really handy for mopping up any juice. 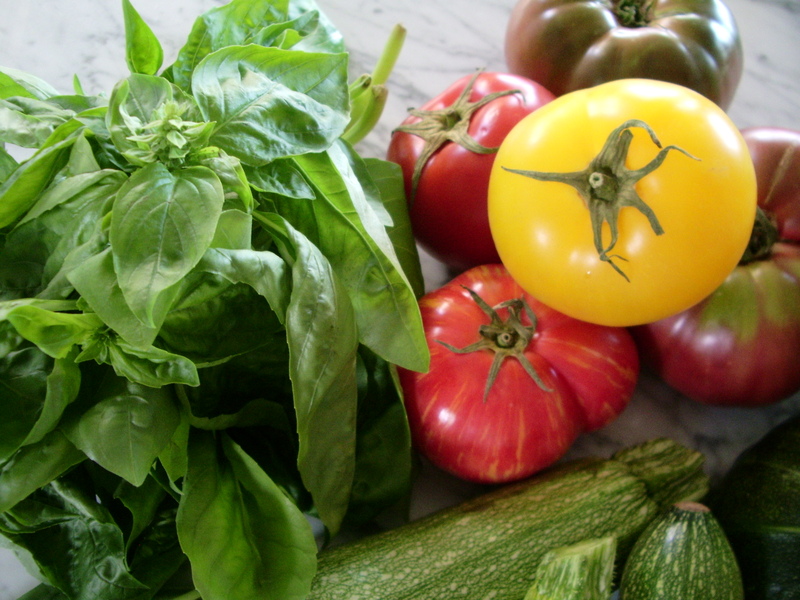 This entry was posted in California, Farmers Market, Food, Los Angeles, Lunch, Recipes, Salad, Seasonal, Starter, Vegetables and tagged basil, heirloom tomato, heritage tomato, tomato. Bookmark the permalink. Stunningly beautiful! You plated the salad so nicely and I can imagine how wonderful they smelled. Thank you. But I’m not sure that I had much to do with it really – the tomatoes should take most of the credit! Gorgeous colors in the pics. Perfect white plate for all that color. Thank you. The colours really are beautiful, aren’t they? And so much nicer than the boring (commercial) red ones! Great photos and a lovely summer salad! Thank you. I’ve been eating a lot of tomato salads recently – they’re perfect for warm days. I love tomatoes so~ much that, at the store, even if I don’t need them I make sure I go to smell them. I LO~VE these photos. And your salad? Magnificent!!! Ha!Ha! I’ll have to start doing that as well! They really do have a wonderful smell, don’t they? And I’m so glad that you enjoyed the photos. Great minds think alike! I also had red tomatoes from my garden & yellow tomatoes that I bought at a local market with fresh basil from my garden! I love yellow tomatoes too! MMMMMMMM! It really is that time of year, isn’t it? It must be lovely to be able to pick and eat them from your own garden. Fabulous! 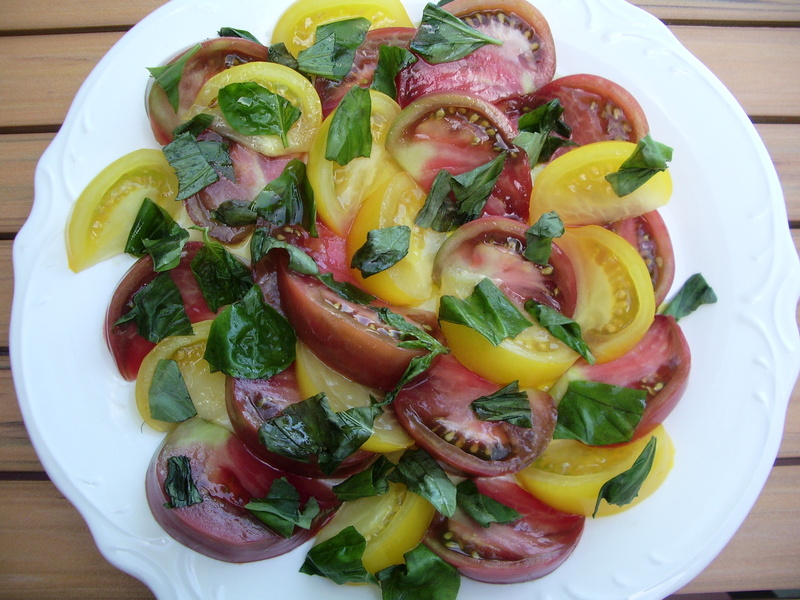 Nothing more beautiful or delicious as a simple salad made with heirloom tomatoes and fresh basil! Lovely photos! Thank you. The simple dishes really can be the best, can’t they? Yes! My Cherokee tomatoes are finally starting to ripen & I’m in heaven. Well, I’m definitely looking forward to hearing about it when you do! I love your photos. So…juicy the tomatoes! Great blog. Thanks. Thank you! It really was a lovely salad. Yes, I really do appreciate being able to access such wonderful produce as this. It was certainly a lovely salad.